Fancy some punk classics in your collection? 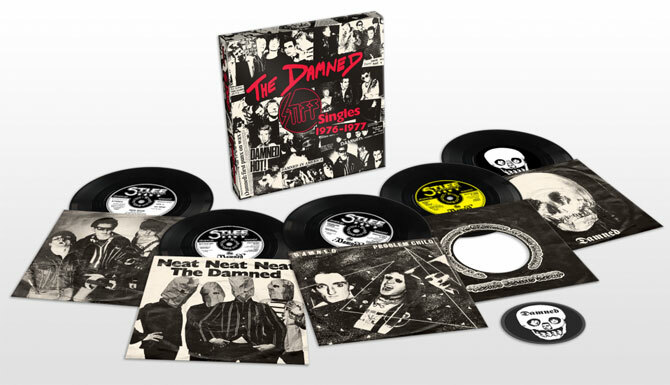 Check out this upcoming gem, The Stiff Singles 7-inch box set by The Damned. One of the first punk bands to get a record deal (and release a record), The Damned produced five singles for the Stiff label (including a final one only given away to fans at gigs) from 1976 onwards, all of which are reproduced and reissued in this rather cool 7-inch box set. A chance to pick up some rare vinyl or but a second time if your originals are worn out. All five singles come with the original artwork and in a box featuring original press cuttings. To top things off, you also get a Damned patch, which is exclusive to this set. The singles are New Rose, Neat Neat Neat, Problem Child, Don’t Cry Wolf and Stretcher Case Baby. If you want the box, it is released on 30th March but available to pre-order now, selling for £62.19.